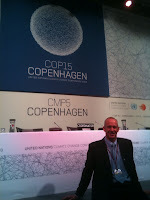 KIRF Co-Founder Mark Kirwin attended the United Nations sponsored COP15 Climate Change Talks in Copenhagen as well as the runner-up conferences in Bangkok and Barcelona as a volunteer mediator for Mediators Beyond Borders. As a witness to the plenaries in Copenhagen he saw first hand the difficulty of reaching accord with the many different interests, situations and perspectives represented by the international negotiators. The COP15 climate change talks in Copenhagen were not a failure. Quite to the contrary, great strides were made in weaving the diverse cultural and political differences of our world into a cohesive whole to attack climate change. Having personally observed the many contact groups negotiating text in Bangkok, Barcelona and Copenhagen, it became apparent that the negotiators were trying to create a climate change document that would be legally binding while at the same time addressing the concerns of their individual countries and groups of countries. For instance, addressing adaptation in neighboring nations that are experiencing cross-border desertification as opposed to an island nation that faces rising sea levels and acidification is complex and multifaceted. Choosing a certain text option proposed by one country group, as opposed to another option proposed by another group, could have devastating effect on the economies of the group whose option was not chosen for the final text. Therefore, the contact group chairs worked tirelessly trying to form consensus on bracketed text and agreeable options to the text. To complicate matters more, there were two separate treaty tracks being negotiated, one under the further commitments under the Kyoto Protocol (CMP 5), and the other for long term cooperative action under the convention (COP 15). When negotiating text in the contact groups, it was often mentioned that a particular group needed to know the decisions of another group because those decisions would have significant impact on the text that the first group was negotiating. And, due to the need for consensus, before a particular option was chosen or brackets taken off text, the contact groups were constantly seeking information from the other groups negotiating text in order to ensure cohesiveness as the treaty documents developed. It seemed that the flow of information and the arrival of the ministers from around the world, who became involved in the negotiations, became the biggest challenges during the last few days of the conference in Copenhagen. It was apparent by most that a legally binding treaty would not result from Copenhagen due to the complex differences on key elements of the text that still existed. However, leaders from 193 countries meet, talked and negotiated in Copenhagen to address the reality of climate change issues. And, an Accord was reached on climate change with a deadline of next year to agree upon the legally binding text and to begin funding for adaptation and setting mitigation targets by major emitters around the world.